So what's the best part about living in Central Illinois? Well, that would depend who you ask. 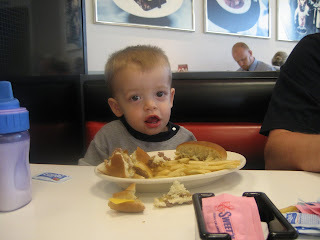 If you ask my Grandma Becky, Aunt Wendy or Aunt Kelly, they would tell you the best part is STEAK 'N SHAKE! Yep, they LOVE that place! In fact, when they come to visit, we have to eat there at least twice... but as you can see, I don't mind. I LOVE their french fries!!! I LOVE the sweater vest! He's so stinkin' cute! 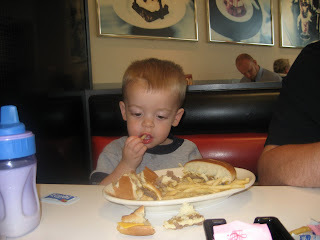 And Brock loves fries, too! 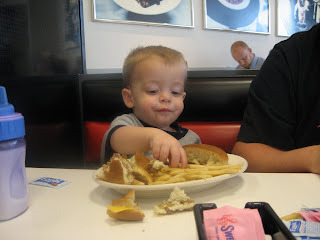 If all else fails around dinner time, give the kid some fries and it's all good. I don't know if you've heard, but they make really good cheese fries there too!